Hos Dorte: Think Pink, A DT card for HM&FMC. 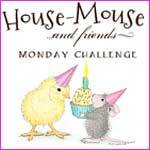 It's Monday and House Mouse & Friends is here with a brand new challenge for you. featuring sweet Monica throwing petals over all. A mousey bundle donated by teamie Diane for another lucky winner which includes Stampendous stamp "Mix it Up" and 6 mtrs of pink ribbon. We hope you will 'Think Pink' together with us. Hi Dot, what a happy card and oh so pretty in pink. Such a pretty card dot. Sweet image and gorgeous designer papers. Thank you for entering our challenge at Penny Black and More this month. Eine wunderschöne Karte hast du gewerkelt. Der Sketch ist toll umgesetzt. Such a sweet card. Cute image. Your embossing is a fabulous touch with this layout! 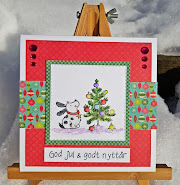 Thank you so much for sharing your incredible creation with us at Creative Knockouts Embossing Challenge. such a sweet card :) Thank you for playing along with us at the simon says stamp wednesday challenge! Eine phantastische Karte! Danke daß du bei den Sketch-Tanten mitmachst. Thies is so cute, wonderful card. Thank you for joining us at the Sketch-Tanten challenge and i hope to see you again.